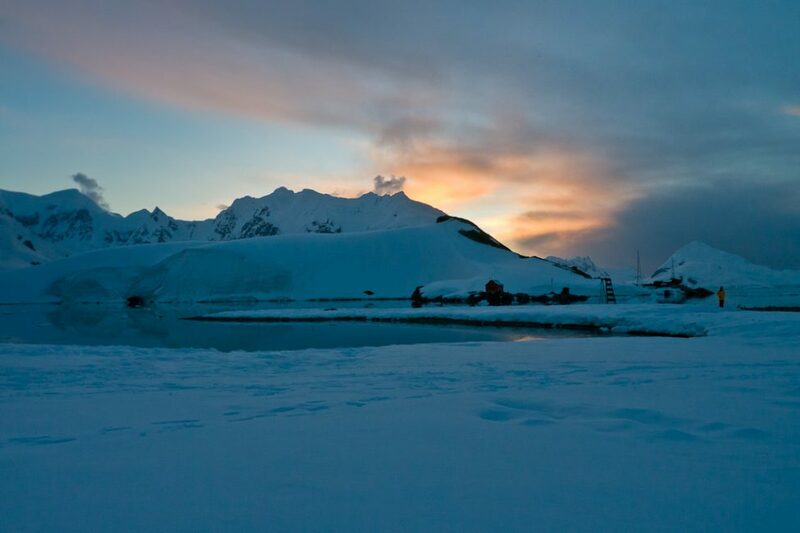 Camping in Antarctica is certainly one of the most unique things we will ever do in our lives. To sleep on the 7th continent with nothing but a bivy sack and a sleeping bag between you and the snow is one of the most adventurous things we could do at the bottom of the world. The night was freezing and our toes were like blocks of ice by the time 5:30 am came around, but we will have a story to tell for the rest of our lives. We were only on the continent for a total of 9 hours. We landed at 8:30 pm and packed up at 5:30 am. It's a good thing too. You are not allowed to take any food or drink except for water on Antarctica and you are not allowed to go to the bathroom. Not even number 1. Nothing and I mean nothing is allowed to be left behind. So after a sparse dinner with very little water or wine, we packed up our bags and set out to the shores of Paradise Bay where we spent the night overlooking the harbour. It was a spectacular evening with a full moon rising before our eyes. The wind was calm and the weather was as warm as it could be for a place like Antarctica. 31 of us slept in the snow that night and we all survived. We listened to the lull of the generator at the Argentine Research Centre drowning out the noises of the snoring coming from both the people and the Weddell and Fur Seals that set up camp right beside ours. They gurgled and cooed all night long and at one point I thought that my stomach was growling, but it turned out to be a seal possibly farting in the wind. We awoke to an early wake up call. At 5:10 am, Solan our guide yelled, There are exquisit things to be seen today, wake up! We leave in 20 minutes. In the blink of an eye, we packed up our camps and caught the zodiacs back to the ship. In an instant it was over, but we'd always have a tale to tell. We followed the footsteps of Shackleton, Scott and Byrd. It may have only been for one night, but we had a taste of what these early explorers went through and can attest, that they were hearty souls. The men who pioneered the exploration of this continent suffered and struggled and after spending a night in their shoes, we have the upmost respect for what they accomplished. 3 Responses to "Camping in Antarctica, The Videos and More Tales"
This is incredible. How well were you able to sleep? We actually managed to sleep ok. We woke up every once in a while to grab some fresh air outside the bivy sack and to try to warm our toes. But surprisingly the night went by quickly.